Arguably the birthplace of the skyscraper, Chicago has held the title of tallest building twice in skyscraper history. In 1892, the Masonic Temple rose twenty-two stories at the corner of Randolph and State Streets. With its high pitched gables and flat-topped roof leveling off at 302 feet, the structure was shorter than New York's World Building with its lantern, but boasted the highest occupied floor (cf. this issue for the Sears Tower). Designed by Burnham and Root, Chicago's most prominent commercial architects, it featured a central light court ringed by shops on the first nine floors with offices above and meeting rooms for the Masons on the uppermost floors. 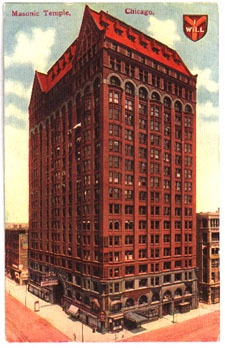 The Masonic Temple employed a rigid steel frame with wrought iron windbracing placed diagonally between the structural members above the 10th floor. As light was a prime concern, large windows were installed from top to bottom, clearly illustrating the practicality of a steel-framed building. It was described as "perhaps the frankest admission of a structural and economic necessity ever expressed in architectural form." Due to height regulations enacted in 1892, The Masonic remained Chicago's tallest building until the 1920's when the city's new zoning laws permitted towers. In 1939, its offices and stores considered old fashioned, The Masonic Temple was demolished.